PRC and Board of Nursing (BoN) released results of December 2012 NLE - nursing board exam in only 30 working days ahead of the expected results date. Passers are now inquiring for the registration requirement and schedule, verification or checking of ratings and the much-awaited oathtaking schedule announcement and venue. First, PRC Board News.com would like to congratulate all passers and topnotchers for your good performance in the recent exam. The road to success and to your dreams now starts as you're looking and focused now on your chosen career. In order to be a member of the nursing organization of the Philippines you need to file for the registration and take your oath. pay the Initial Registration Fee of P600 and Annual Registration Fee of P450 for 2013-2016. 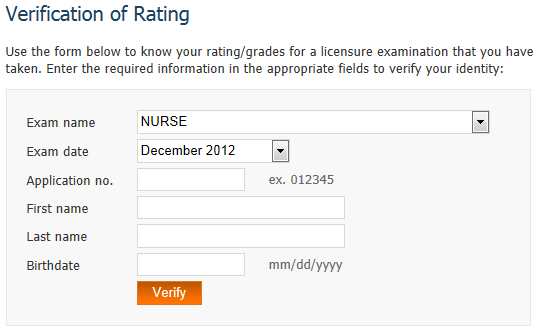 Through Verification of Ratings (VoR) online on PRC website, December 2012 NLE passers will be able to check grades by entering the required information in the appropriate fields. Some of the required information includes application number and birthdate. "CONGRATULATIONS TO ALL DECEMBER 2012 NLE PASSERS. 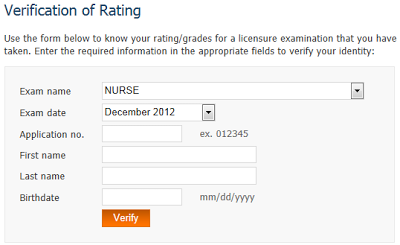 THE BON WEBSITE CARRIES AUTHENTIC RESULTS AND FOR INFORMATION OF ALL THE PASSERS ... YOU MAY SECURE YOUR INDIVIDUAL NLE RATINGS-REPORT VIA THE PRC WEBSITE BY LOGGING ON www.prc.gov.ph and click on the appropriate tab and follow instructions therein. Please be patient in searching and waiting until the uploading of all data is complete. This should be available within today and days following. Again, patience is a virtue. If your name is in the alpha list of the NLE Results then there is no reason why your individual ratings will not be available at the prc website link... AND THIS IS ACCESSIBLE ONLY TO YOU! ", Sto Tomas said.